Sigh. I am writing this with a heavy heart. I separated you both for good, is what I thought. Two days back when you both met after 3 weeks, the spark in your eyes, makes me want to ask sorry. This is all Amma could do. You are safe with your grannies and that makes me feel very safe too. When with Missy I miss you beta Shelly and when with Shelly I want to see you Missy. If only there was a solution babies. If only. I promise to travel 30kms daily to be with both of you for whatever small time possible. Ultimately Shelly is growing up watching star plus and Missy watching eTV. All in all its saas bahu athe sose dramas. Till you start chota bheem and yada yada cartoons enjoy the bakwaas. This is my favorite pic of you both of late. Loads to learn from you two. I promise to learn fast. 10 reasons why you should *not* choose health care at Columbia Asia, Mysore. Please note that the patient was not adult but 4 months old baby. The AC was not functioning properly and when temperature was lowered fool smell entered room. Every tucking time. 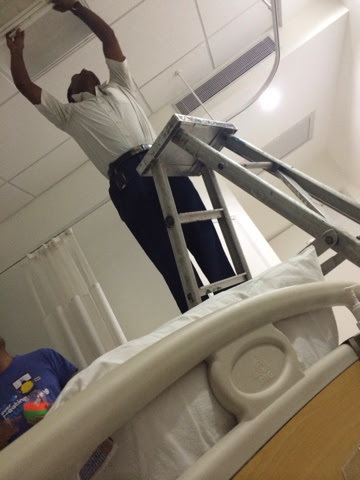 Main light was not in working condition and when asked was replaced during the stay instead of changing room. Isn't it obvious that before assigning a room all this has to be taken care of???? They quote cradle but for a 4 months old baby provide newborn nicu crib and did not even arrange for one. Thankfully we were permitted to get a cradle from the house. They charge 550 for nursing and the only work they do is, enter data into computer at nursing station and write who is responsible to care of the room in that shift. But actually no one cares. They did not assign a paediatric nurse for us. On top of that they refuse to cater to baby needs. They ask everything for the parents and expect not to call them for services. Quoting less staff reasons. We finally booked a nurse full time for the night and worst being that nurse was used for other rooms due to man power shortage. We asked the nicu staff to provide sponge bath and no one even cared. They don't take care nor do they let us take care. After so much tantrums we were allowed to have an extra bystander coz it's baby. One brother stopped the drips flow instead of loading the box. Imagine when the baby is only on drips what the outcome is. Security don't allow food inside and food facilities deny food. No milk so no coffee. No cups so go drink coffee at the canteen and we cannot give it in the room are few things told to us. How can the baby be let alone??? Food plates and glasses are not cleared timely basis. The plates still ly and the next timely food arrives. This hospital is only good for OPD where each patient is mapped to a nurse but otherwise no one cares. Everyone wears suit and roams around but no one works. There is no accountability, no coordination and finally no one knows what is happening to the patient.